It’s a perennial problem, especially at older theatres: trying to get to the loo during an interval is so often an ordeal. There just aren’t enough of them to meet the demand. And now that some theatres are trying to solve the problem by robbing Peter to pay Paulette, men are facing an issue that is all too familiar to women, too, as the provision of men’s loos is drastically reduced in favour of extra accommodation for women. 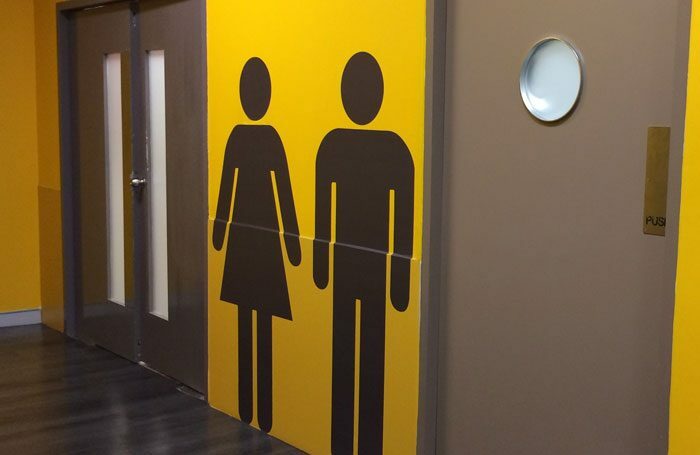 It’s not unusual to now see long queues for men’s loos as much as for women’s. The laughable men’s loo at the back of the Phoenix Theatre stalls, for instance, has just one lock-up and three (very intimate) urinals that are decidedly not for the pee-shy. (Neither, of course, is London’s longest theatrical urinal in the bowels, in every sense, of the Barbican, which has plenty of room but no privacy whatsoever, with no divisions along its entire length). Last year, the Theatres Trust launched the Spend a Penny scheme to give grants of up to £15,000 to improve toilets for women. It’s a step in the right direction to acknowledge the lack of provisions. But I also recognise that in some older buildings it may not be easy, as the space may not be there to make the improvements. Still, at least we’re not Broadway, where the (invariably subterranean) ‘lounges’, as they’re euphemistically called, are even more minute, and queueing to use them can take the entire interval. Yet the worsening problem coincides with theatres increasing their efforts to up-sell drinks to their audiences, with Ambassador Theatre Group offering an at-seat Ordertorium service that has ushers deliver them directly to your seat. Perhaps they should also sell disposable urinal packs, so you can pee at your seat too. At least at the National this is easily achieved, with loos on every floor (and plenty of ‘secret’ ones hidden away so those in the know can get to an unoccupied one. But no, I’m not telling you where the secret ones are). That is, in fact, my best tip for trying to get to the loo in the interval: search out ones that no one knows about. There’s one in the Old Vic stalls, for instance, that means you don’t have to descend to the downstairs bar. And if you’re in New York, learn where the nearest hotels are. There’s one near to most theatres – and it’s always quicker to go there.